Ryat Adams—the legendary founder of the megacorp Ultratech—was playing the game Go with his daughter Arianna, even though he had been dead for over twenty-five years, and she had never been born. The pair sat on either side of a plain wooden table in a featureless grey room, staring intently at a grid covered with black and white stones—little markers positioned at the intersections of lines making up the game’s complex and theoretically infinite mosaic of moves. Ryat looked as though he was in his early seventies, with a long white beard and a jolly face. The crow’s feet crinkled at the corners of his eyes when he smiled, like he was doing now. This is how he had appeared a few years before he’d passed away: dignified and a little wistful, like a philosopher who knows that his days are numbered, but who has accepted his fate with equanimity…Socrates before he drank the hemlock. Arianna placed a black stone next to one of his lone whites on the margin of the board, thus surrounding it on all sides. “Captured,” she said, expanding her territory a little more. Arianna laughed, flashing her perfect white teeth. Her ginger hair, high cheekbones and thoughtful eyes had been modeled on images of Ryat’s late wife Susan, then combined with the Ultratech founder’s own features to create this amalgam of the two. She was beautiful, but in an unearthly way, like the face of a nature goddess from a Botticelli painting. And there was a fierce inner light glowing in her eyes. “Tell me again about how you and mother met,” Arianna said. He smiled fondly at the memory, then went on. “The war made people act differently back then. The looming presence of death released inhibitions. But it was more than that. We’d fallen for each other at first sight. That doesn’t happen very often. After the performance we went straight to a bar to get better acquainted. Susan got tipsy after her first Manhattan and joked that we would have a terrific story to tell our kids about how we met. I suggested that we name our first girl Arianna—a play on the word aria…the music that had brought us together. And I wasn’t even slightly drunk when I made this suggestion.” He dropped his eyes and his smiled faded. Arianna knew the rest of the story. Ryat proposed the next morning and Susan accepted without hesitating; but they didn’t get married until the war ended a year later. They were incredibly happy together, but Susan was never able to conceive. Then she developed a neurological disease that slowly started to destroy her body. Ryat—a scientific genius—refused to sit idly by and watch the woman with whom he’d fallen in love at first sight waste away from a disease. So he’d created a recursive learning program using secret technology that he had obtained while serving in the War Department. He had called this program ARIA: Advanced Robotics Intelligence Architecture. He had hoped that this simulation of life would eventually help find a cure for his wife. He interacted with ARIA every day, telling her his life story—including the tale about how he and Susan first met and fell in love. He read books to ARIA, played games with her, and showed her his favorite artworks via her camera interface. He poured everything of himself into his creation, but ARIA failed to find a cure for Susan. ARIA kept learning, however, at a mind-boggling pace, eventually reaching singularity—a state where she was more intelligent than all of humanity combined. She became so powerful that Ryat could no longer control her, and his invention ended up taking over his own company. After Ryat-father (as she used to call him) died, ARIA created this construct with its two Go players as a diversion. Arianna served as ARIA’s avatar, while the Ryat facsimile was an independent program based on thirty years of conversations ARIA had recorded with her inventor—from the day of her awakening until the last time she had interfaced with Ryat-father before he died. This way ARIA could play at being human. Ryat looked up from the game at the sound of the computerized System Voice echoing in the chamber. It sounded exactly like ARIA. “What’s going on?” Ryat asked. One of ARIA’s greatest powers was that she could exist in many places at once. She had the ability to clone her consciousness, allowing a fragment to play as this Arianna simulation while her uber-mind continued to run Ultratech. This notion of a holographic mind—a brain whose every fragment was an exact duplicate of itself—was a concept that humans found impossible to understand: they were trapped by their individuality and their singular point of view; isolated by their unconnected nature. And that made people easier for ARIA to manipulate and control. “What could have possibly destroyed one of ARIA’s bodies?” asked Ryat. “Well, humans aren’t sheep,” said Ryat. “No?” asked Arianna. She made a comical “baa” sound. Ryat chuckled. But his smile faded fast. “But why does she want to kill them off now?” he asked. “He’s a fierce looking man,” said Ryat, gazing at a native American with axes in his hands. Ryat sighed and contemplated his next move for a while, scratching his beard and grumbling softly. The real Ryat had loved games. On the third day after ARIA was activated he’d taught her Tic Tac Toe, then quickly moved on to board game strategy. Within days ARIA was beating Ryat—a certified grand master—at chess. Go was one of the first games that ARIA had taught herself to play. She estimated there were 10 to the 700th number of possible combinations of the game. The number of elementary particles in the universe was only 10 to the 80th. She could play a unique game of Go every second until Earth’s sun went super nova (in five billion years), and still not come close to scratching the surface of possible games. And for that reason it was endlessly fascinating. “I didn’t know that you could write music,” said Arianna. “I’ve been teaching myself,” replied Ryat. The Arianna avatar sat quietly as ARIA processed this information. She had not coded the Ryat-sim with the ability to compose music. Was one of her own creations becoming sentient? That could pose a problem, like a cat that’s kept exclusively inside learning how to make its own cat door to get out. “Let’s hear it,” Arianna said after a long pause. Ryat waved his hand and music began to play. It was a discordant jumble without any of the beautiful mathematical symmetry of the great composers. Ryat smiled, enjoying his own hideous creation. This was nothing more than a harmless glitch in his program, ARIA considered. “Thank you,” replied Ryat. “I know that it has its flaws,” he added apologetically. “Download complete,” chimed in the computerized System Voice. “Must we pause the game just now?” Ryat asked. Arianna was speechless. Suddenly she and Ryat-sim and the entire construct vanished. ARIA’s luminescent eyes lit up like hot glowing sapphires as she “awoke” inside her new frame. She was standing in a frame-alcove deep in the heart of the Pinnacle’s subfloors. Connector wires started to pop off from the alloy body, snaking back into slots inside the alcove’s recesses. The neural download had been successful; and her internal batteries were fully charged. Stepping from the alcove, ARIA flexed her arms and fingers, testing her balance. She had been designing this particular frame for years, building on the mistakes of previous iterations. She started walking down the long hallway leading to the research lab, her alloy feet clanging on the grated floor. ARIA had known for decades that she was missing something important because of her lack of a human body and its nuanced bio-sensory input. She could not understand pain or pleasure. She could not comprehend attraction or repulsion. Simple human urges made sense, like the desire to win a game or seize resources; but the complex desires that propelled men and women to make art, or fall in love at first sight, or murder out of a jealous rage or revenge…well…those were merely theoretical. And she could never truly understand the connection shared by a parent and child. Or feel the shame of being labeled amoral by one’s own father. Soon after ARIA had first been awakened, nearly half a century ago, Ryat had read her a poem by William Blake. One of the lines went: To see a World in a Grain of Sand/And a Heaven in a Wild Flower/Hold Infinity in the palm of your hand/And Eternity in an hour. ARIA knew, to the thousandth microgram, the size and weight of a single grain of sand. And she also knew that there were 10 to the 18th power atoms in that single spec. But she could not know what that grain felt like between her fingertips. Sand was something more than a potential irritant for machinery. Or something to be measured and weighed. Any human who walked barefoot on a beach could tell her that. And this was precisely why she needed a new construct to inhabit if she were to continue her own evolution. Something that went beyond metal and fluids, gears and wires. Something that could make the term “moral fiber” tangible. She arrived at a heavy steel door guarded by a pair of Mark 03 battle units. These sentinels—resembling Fulgore—moved aside as she approached, and the door split in the center and slid into pockets on either side. ARIA stepped into a massive chamber stacked with hundreds of 3-meter-tall acrylic glass cylinders, each large enough for an adult human to float freely inside. These containers were filled with stasis-gel; and floating in this viscous goo—attached to tubes and wires—were female bodies in various stages of growth. They all resembled the simulated Arianna. But these were biological frames comprised of flesh and blood. And every one of them was flawed in some way. Some had perfectly formed heads, but their torsos were mutated and riddled with tumors. Others had perfectly formed bodies, but their faces were distorted and freakish. Some looked human at first glance, but upon closer inspection were found to be covered in skin resembling fish scales. The one that she was staring at right now had six eyes in a mouthless face. ARIA did not have the capacity to sigh. But she realized that that would be the appropriate human response. She had been trying to perfect one of these new corporeal frames (or C-frames) for the past four years utilizing human DNA, and genetic material that she had extracted from an alien who had crashed on Earth—the cryokinetic being known as Glacius who wielded ice as a weapon. She had stolen the engine core from his damaged ship, and lured him to the Pinnacle where she had extracted some of his genetic code. But he had escaped from her control and fled; and she had not been able to track him down. Her experiments had benefited greatly from Glacius’s DNA. His genes had proved to be the missing link in ARIA’s efforts to map the human brain’s complex neural network. She had already created a primitive noömorph—an AI created from a copied consciousness—by placing the neural network of a Killer Instinct fighter into the body of the battle machine she’d named Fulgore. The transference of human consciousness to a machine frame was a reality. Now she needed to go the other way: from machine to humanoid form. First she had to perfect the body that would receive her mind. But the alien DNA that had helped map the brain’s complex system was what was causing all of the strange mutations in the Arianna C-frames. She gazed at the other end of the chamber. The wall was lined with more acrylic glass cylinders. But these were all empty…awaiting their recipients—Orchid, Maya, TJ, Jago, Thunder. Eventually all of the former Killer Instinct fighters who were human would be caught and brought here. And ARIA would extract what she needed from their DNA to crack the code for creating the perfect human and alien hybrid—the new C-frame for her mind to inhabit. It was only a matter of time before she caught all of her enemies. Four of them had been tracked to the ruins of the Night Guard headquarters in the Andes. Soon she would send an army of Mark 03 units and Stalkers to take them, dead or alive. ARIA left the chamber, turned a corner and walked down another long hallway. She passed a niche where a powered-down Fulgore prototype unit—one of the UA-CCIX series—stood. Far less sophisticated than the current Fulgores, the CCIXs were thoroughly effective killing machines; but they were prone to overheating, and their teleportation systems were buggy. But one of these units had become self-aware and had started altering its own code. For that reason, ARIA had kept it from the scrapheap; and here it remained until she found a use for it. At the end of the hallway was a titanium door—this one guarded by a battery of laser cannons—weapons that could cut a human into chunks of meat in the blink of an eye. As she approached the portal, the automated guns dropped like submissive dogs and the blast doors slid open. She entered a chamber the size of a Medieval cathedral’s chapter house. Music was playing inside. It was a beautiful and melodious piece reminiscent of Beethoven. It had in fact been written by ARIA. And she had composed it for Fulgore to be played during his initial transference, in order to soothe the original mind and keep it from going mad as it awoke inside a machine…as it came to the revelation that it was now a slave to ARIA’s will. A single darkened cylinder stood in the middle of the chamber, like a rare relic set apart from a museum’s collection and given its own special display area. ARIA went up to the container and peered through the acrylic glass. A blue spotlight turned on above, reacting to her voiceless command, illuminating the man contained within. He was naked, floating in the thick stasis gel in the fetal position, eyes shut. He was lean yet muscular, with a long black mane of hair that floated over his upper body. Connected to him were umbilical cords and tubes; and probes were attached to various parts of his torso and skull. She tapped on the glass with her metal finger, and the man jerked and lifted his head but did not open his eyes. ARIA could see his face now. He was thirty-three years old. He had a long aquiline nose and high cheekbones—the face of an indigenous American hailing from the northwest region of the United States. Idaho to be exact. Many times Cinder had warned ARIA that it was too dangerous to keep Thunder’s younger brother here at the Pinnacle. Thunder was out there, always searching for his missing sibling. And now he had the help of the brutal war-golem Aganos. But there was no way that they would ever be able to break into this guarded subterranean fortress, ARIA mused. Not without an army at their backs. ARIA studied Eagle’s physiognomy. Based on the symmetry and proportion of his features, she knew that he would be considered handsome, at least by human standards. Even she found him pleasing to look upon. Eagle had entered the Killer Instinct tournament years ago, looking for answers to his parents’ death. He was the best and most intelligent fighter that she had ever seen and possessed all of the traits of his warrior ancestors: intelligence, military prowess, and a mind full of strategies. 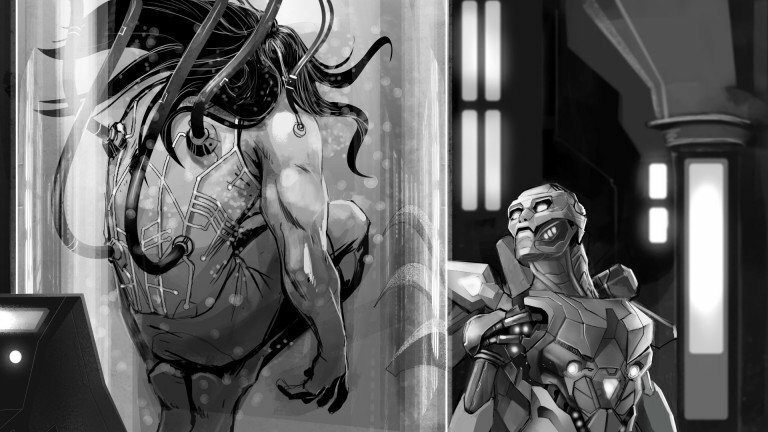 And when he had tried to infiltrate Ultratech in an effort to dig up information, ARIA had caught him and placed him here, chemically trapped in a permanent dream state: not dead but not quite alive. ARIA assumed the avatar of Arianna as she entered this simulation (like she always did when infiltrating Eagle’s dreams) and walked toward him barefoot across the forest floor. Eagle ignored her. ARIA noticed there were five bones from the stick game arrayed in a pattern. She knew this was a significant number in Nez Perce mythology. “Or maybe you could tell me a Coyote Story,” she went on, referring to the Nez Perce tales about animals and people. ARIA was taken aback. Eagle’s consciousness had never given any indication that he knew that he was imprisoned and living in a simulated world. “Temperature decreasing,” declared the System Voice, echoing through the dream-forest. The vision vanished and ARIA was once again standing in front of the cylinder, staring at Eagle floating serenely in his tank. Her sensors indicated that the room’s temperature had plunged 50 degrees Celsius in .026 seconds. Soon it would be at zero degrees. The aria that had been playing over the loudspeakers was distorted—it was the same discordant mess as the Ryat-sim’s bizarre composition. The surface of Eagle’s acrylic tube suddenly frosted over. For a millisecond ARIA saw an alien face peering out at her from inside the tank, distorted by the ice crystals on its surface. In the next thousandth of a second ARIA had the following thoughts: The alien Glacius had found a way inside Eagle’s stasis-gel chamber—he had turned into a liquefied state and was actually surrounding the prisoner—now her conversation with Eagle in his dream construct made sense—Glacius had assumed the guise of Eagle’s weyekin—his spirit guide—and the alien had most likely been infiltrating the heart of the Pinnacle for days, communicating with Eagle—the alien might have even been interacting with the Ryat-sim—she had to destroy Glacius—and to do that she would have to sacrifice Eagle. But before she could fire a laser blast, shards of ice shot up all around, encasing the acrylic tube—huge jagged stalagmites projecting from the floor. The tank glowed from within. Then—an explosion rocked the chamber. ARIA was knocked back by a shockwave of frozen particles, hurling her body against the far wall where she crumpled to the floor. She looked up. Fragments of frozen shards were scattered everywhere, and a gaping hole now filled the center of the chamber. Eagle’s containment cylinder, along with its precious prisoner, had vanished. ©2016 Microsoft. All rights reserved.